To earn their Bronze Awards, they built three new benches for the Moorestown Library patio. One of the most rewarding experiences throughout a Girl Scout’s career involves completing service projects to earn the Bronze Award, and later advance to the Silver and Gold Awards. Recently, three members of Moorestown’s Troop 25288 took the first step, earning their Bronze Awards by constructing three new benches for the Moorestown Library. Fellow troop members and friends Allison Diggons and Alexandria Esser, both sixth-grade students at the Upper Elementary School, alongside Natalie Sullivan, a sixth grader at Voorhees Middle School, began their joint bench-making project last June. However, the idea for this project arose only after the girls experienced a minor setback. Initially, the three Scouts planned to make renovations to the women’s bathrooms at Elks Lodge in Marlton, however the organization said renovations were not needed at this time. Soon after, while attending an event at the Moorestown Library, the Scouts learned this facility was in need of new patio benches. In response, the girls committed to constructing the benches and began their project in June. Natalie’s uncle John Heisler, a construction manager, assisted the Scouts in developing a decision plan and taught them how to use the tools necessary. He also advised them to use cedar as their wood choice, for it is extremely long-lasting. Upon assembling their first bench, the girls hit their second bump in the road. This time, they realized they had screwed the parts of the bench in incorrectly and thus had to unscrew all the pieces and start over. “I liked sawing the wood down to the right amounts because I was able to feel like I was really accomplishing something. It was an important step that all-in-all would help us to help the library,” Alexandria added. After putting in the required 20 hours of service to complete the project, the girls had constructed three benches. 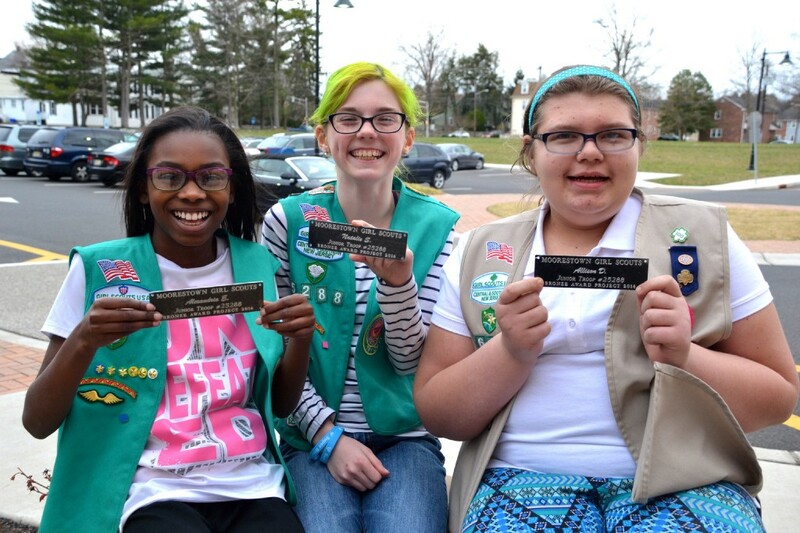 Troop 25288 leader and service unit manager of the Moorestown Girl Scouts, Maryellen DeMille, asked the library if it would be interested in paying for plaques with each girl’s name on them to be attached to the benches. The library agreed to purchase the plaques to recognize the effort of the Girl Scouts and DeMille had them made. The plaques were attached to the benches by Heisler at the Moorestown Library on the evening of Monday, March 13. All three Girl Scouts plan to next work toward achieving their Silver Awards. While they had fun and success in working together for their Bronze Awards, the Silver Award must be achieved individually.